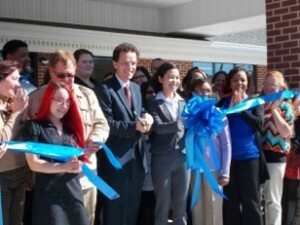 On Thursday afternoon, we hosted our ribbon cutting ceremony on a gorgeous fall day. Many local members of the community came out to show their support including the mayors of Wake Forest and Rolesville. 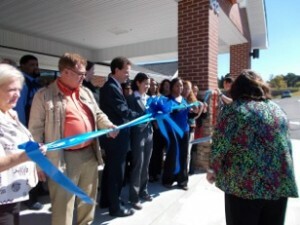 The first Discovery Point center opened in 1988, and since then, 52 centers have successfully opened in the southeast. Discovery Point Heritage is an exciting addition as it’s the first, of hopefully many, in North Carolina. Our corporate leaders, Director of Operations, Cindy Siegel; Manager of Education and Training, Andrea Moore; and Manager of Quality Assurance, Rhonda Canerday, were able to join us and say a few words to highlight what makes Discovery Point such a special child care facility. Andrea Moore explained how the teachers will be using the Creative Curriculum, a proven, nationally-recognized curriculum for early childhood education. Mayor Vivian Jones of Wake Forest spoke during the ceremony stating that the largest group of people that live in Wake Forest are between the ages of five to nine and that Discovery Point Child Care is a wonderful new addition to the community. Wake Forest policeman, Adam Carlson, said that the safety and security of the center is a huge benefit, and ultimately, a deciding factor that led to his daughter’s enrollment. He appreciated that in order to be admitted into our building, a passcode with fingerprint entry is required. Paulette High, our director, spoke about our food program, stating, “The Chen’s have high expectations when it comes to the food menu for the children at Discovery Point.” “Their plan is to minimize the use of canned food and include organic milk, fresh fruits and vegetables.” The members of the community were able to sample a lunch from our menu on Thursday. They were served corn chowder, pinwheels made with turkey, ham, tomato and spinach. In addition, a fantastic yogurt topped with diced strawberries was prepared by our wonderful chef, Wanda Sutton. Mrs. Chen then touched on the Chinese Enrichment Program which will be offered at Discovery Point Heritage. She wants to give children this unique opportunity in their early years. She explained that it teaches flexibility and adaptability, and that if children are able to learn to speak a different language, they may be more comfortable handling different, uncomfortable situations in the future. We are grateful for the support of our community and want to thank you for coming out and taking part in our ceremony. We hope we saw you this weekend during one of our Open House sessions. If you couldn’t make it this weekend, please call us to schedule your own private tour. We can’t wait to meet you!